Basil, an herb which is used dried and fresh in many Italian and Mediterranean dishes, isn't just great to eat, it is very useful in its essential oil form. Extracted by steam from the ocimum basilicum plant, basil oil has had a variety of uses throughout history. It is now a popular essential oil in a variety of aromatherapy and skin products, as well as the better-known cooking uses. 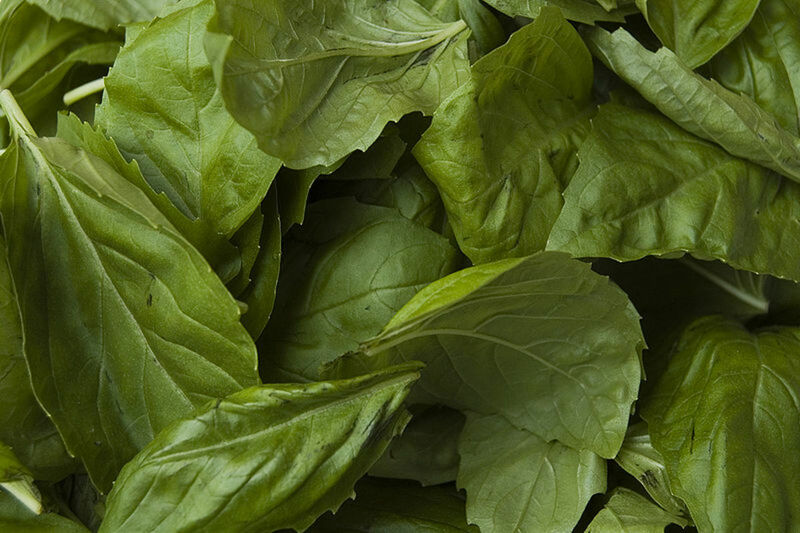 In the Hindu religion, basil is sacred, and its leaves are chewed before religious ceremonies. Basil is also considered a form of protection in the Hindu religion, and it will often be worn to ward off evil while a Hindu sleeps. This herb, which grows just about anywhere and produces a colorful variety of honeybee-attracting flowers, has a spicy, green scent that is often a topnote in perfume combinations. The oil isn't just useful in aromatherapy massage oils, though, there are other interesting and perhaps suprising household uses for basil oil. This article looks at the health benefits, aromatherapy qualities, and pleasures of using basil essential oil. Basil plants are popular in part because they are simple to grow and come in many varieties. There are different colors and shapes of basil - purple, green, bush, curly. Basil also comes in a wide variety of flavored hybrids. At any large greenhouse, you might well find lemon basil, sweet basil, licorice basil, and other scents based on the same plant. While each of these types of basil may be distilled into basil essential oil, the oils from the separate plants will smell and taste slightly different. 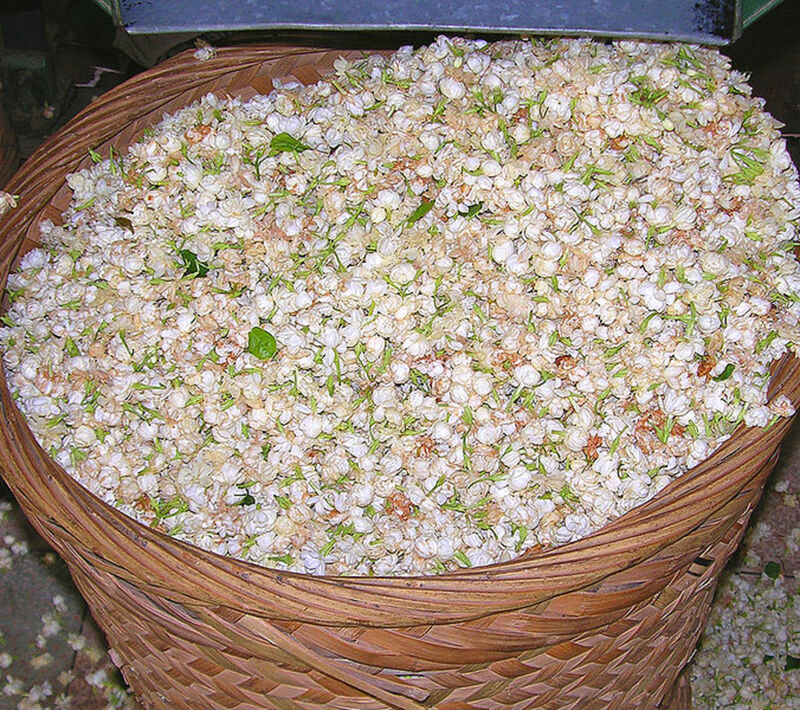 Different types of basil oil are therefore used in aromatherapy products. Every type of basil oil, though, will have nearly the same effects on particular infections, moods, and skin types. Respiratory complaints: Applied on the skin as a compress, basil essential oil can relieve some of the symptoms of sinus infection, bronchitis, asthma, and allergies. Its fresh smell can break up congestion in the chest and sinuses, and it can also help cure these respiratory infections. Basil oil is useful in controlling respiratory symptoms when it is used in diffusers and spread throughout the air of a room or home. Digestive problems: Basil essential oil can be taken internally to relive constipation, nausea, indigestion, and other digestive disorders. Basil oil can also relieve flatulence and excess gas almost immediately upon ingestion, and it can be ingested to help with bowel pain. As with all other essential oils, you should consult with a qualified aromatherapy practitioner before taking an oil internally. 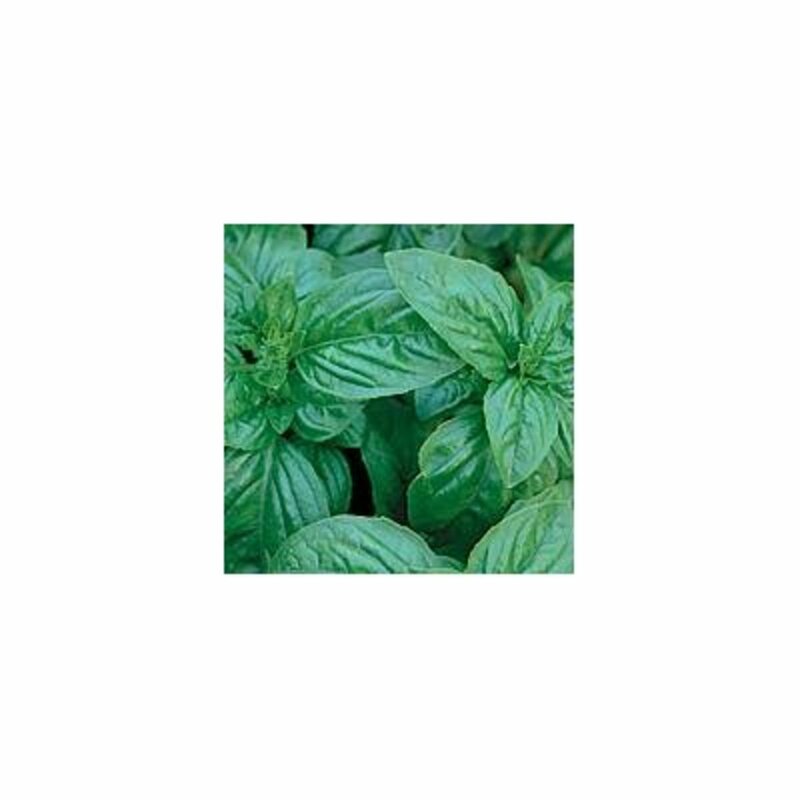 Skin ailments and wounds: Basil essential oil, used directly on the skin, can relieve various skin ailments. The antiseptic and anti-bacterial properties of basil essential oil make it a great solution for basic cuts and other surface wounds. Basil can be applied directly to the wound one or two drops at a time, or it can be diluted in a suitable carrier oil and used as a bacteria-fighting compress. Besides being antiseptic, basil plant oil is analgesic, so it is a doubly good cure for wounds. The pain-relieving properties of basil oil also work to relieve pain associated with arthritis, sore muscles, and burns. Combine a few drops of basil essential oil with a suitable carrier oil, rub it on sore muscles or arthritic joints, and soon the patient will be pain free. Beauty properties: Basil oil makes a wonderfully refreshing massage oil, and it improves skin tone and the shine of hair. Also, basil oil relieves skin conditions like acne and eczema, since it has antiseptic, anti-bacterial properties. This oil is used often in homeopathic skin toners, and some commercial facial preparations use basil plant oil. Fighting internal infections: Basil oil can also be taken internally for infections of the bladder and other bacterial and viral infections. Combating insect bites and stings: In summer, every household should have a bottle of basil oil in the medicine cabinet because it is an excellent alternative to chemical bug bite treatments. 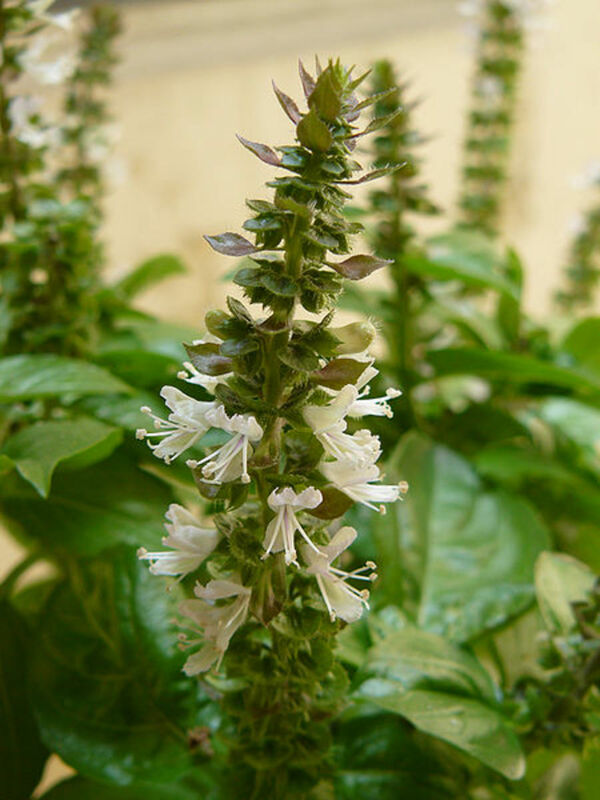 Basil essential oil can be used rubbed on mosquito bites, bee stings, and even some snake bites. Basil oil on wounds or stings like these will relieve pain, itching, and irritation while eliminating the risk of infection that comes with any skin puncture or irritation. A flowering basil plant, with leaves showing around the stalk. Image is in the public domain. As an aromatherapy-grade essential oil, basil can be used in diffusers or oil warmers to lighten the mood of a room. 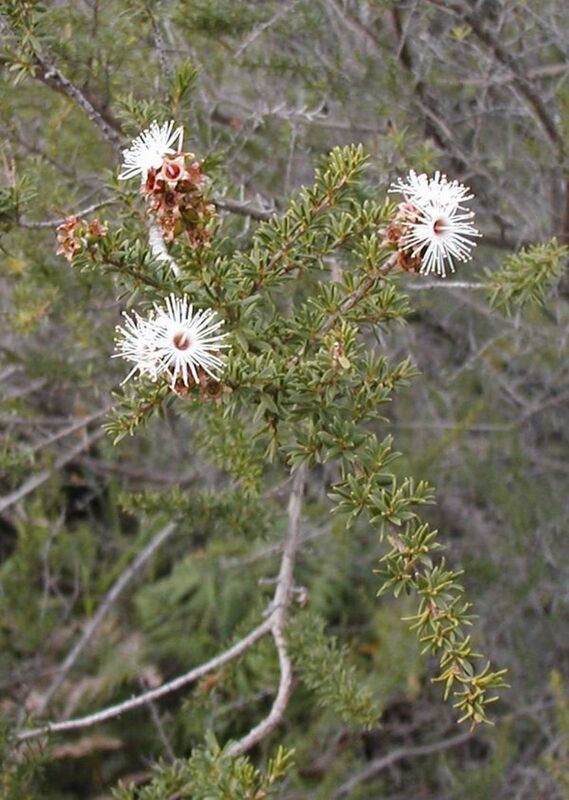 It has anti-depressant properties, and the scent alone can dispel the lethargy and mental fatigue that come with depression. Basil oil is also a good headache remedy, and it can be applied directly to the skin or simply wafted about a room to help relieve severe headaches or even migraines. The scent of basil can also be a great study aid, as it brings mental clarity to a foggy mind. In aromatherapy massage, basil oil is often mixed with citrus oils, such as lemon and grapefruit, frankincense and geranium. Aromatherapy product mixtures also frequently combine basil essential oil with lavender, bergamot, and peppermint oils. In aromatherapy massage oil terms, basil is held to be uplifting and energising, and is often used in essential oil mixtures for people suffering from stress, migraine, and lethargy. A vapouriser is a great way to benefit from the uplifting, concentration-enhancing and energising properties of this aromatherapy oil. While basil has many wonderful healing properties, it can also be somewhat dangerous if used improperly. Unless used in very small quantities, basil oil will irritate most people's skin, so the best way to use this oil is to dilute it in a carrier vegetable oil, or sweet almond oil. Before taking basil oil internally, you should consult a certified aromatherapist. While some aromatherapists say basil oil can increase a mother's supply of breast milk, most medical practitioners recommend that pregnant and nursing women avoid basil essential oil (and essential oils in general) in most forms, other than for normal cooking. If you buy aromatherapy products with basil oil (or other essential oils) in them, check the label to make sure they are safe for pregnant women. Some are, some are not. i have suffering from depression and strees and oneday i drank the water in which I soaked the basil leaves for two hours. To my surprise, I was rejuvanated and my depression was gone.earlier i had sore eye and it was healed after an hour , drinking the basil leaves soaked water. now Im drinking the basil leaves soaked water and Im much energized and livelier. basil has its own fragrance and the strong peppermint taste. The smell of basil in cooking and food is wonderful, isn't it? And the oil has extra advantages! This is a wonderful hub!! I love growing my own Basil and making pesto...now I'll have to learn how to make the oil. It seems its properties are good for many uses!! Basil is wonderful stuff, it really adds to a meal. This is very interesting information. We grow basil in our backyard every year and use it often in cooking.